Having a user-friendly site is a must for making money with your blog or website. How many times have you left a site or closed an app because they weren’t user-friendly? If a website isn’t easy to use and you can’t find what you’re looking for quickly, chances are you’re gonna hit the back button. Well, it’s even more frustrating for the site owner. Because they are losing money every time you hit that back button. Loss of traffic means loss of potential revenue. No sane business owner wants that. UT (also known as “Remote Usability Testing”) is basically the process of having everyday people test the user-friendliness of your products – apps, sites, software, designs… – so you can fix the flaws and bugs in your product before it hits the market. Have you ever noticed “Still in Beta” or “Beta Version” signs on new apps and software? That’s one way of user testing. You may even notice a little note about them offering beta testing jobs. Even video game developers do beta testing. We actually shared a post a while back with a list of companies that pay you to test video games. The “Beta” period lets developers do a test run of the product with the help of users to uncover potential bugs and issues before they release the product to the public. So why would bloggers and webmaster pay me to test their site? In order to give people an incentive to test their site, site owners offer some sort of reward (cash, gift cards, and other prizes) to people who agree to do website testing for them. It’s the same reason why companies pay you to review stuff. 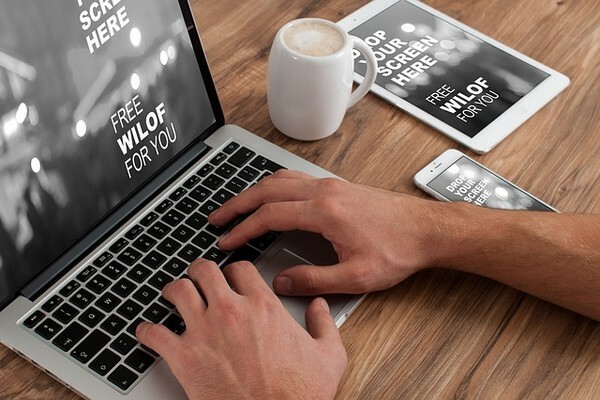 Finding individual users and recruiting them to do website testing is a daunting, time-consuming task that can get expensive quickly for each developer/site owner if they decide to do it on their own. They’d have to dedicate so much time and resources to trying to find site testers that it would outweigh the benefits of usability testing they are conducting no matter what method they use. Thankfully, they don’t have to go at it alone. That’s where user testing tools, software, and websites come in. These platforms connect site owners with users around the world who want to make money as beat testers, website testers, and even bug finders. It’s exactly the same reason why individual companies don’t conduct surveys on their own. They go through market research firms that make it easy and cheap for them to conduct online surveys that pay panelists to participate. By the way, if you like paid surveys and getting paid fast, check out our list of surveys that pay instantly. You (the tester) sign up for these platforms for free. Site owner posts a website testing job with details on how they want it done and what aspects of the sites they want the focus to be on. If you’d like to do the job, you pick it up and go through the process. Once the test is done and approved, you get paid! In some cases, you may be asked to visit a site and search for specific things, then report back your experience and how long it took you to find it. Some tests may require you to video yourself (through screen capture software that’s provided to you) as you conduct the test. Other times you may be asked to visit the site, spend X amount of time on it, then come back and answer a few questions about the user-friendliness of the site. That’s the one requirement that all these platforms have in common. As we mentioned above, some tests require you to (video) record the process of testing. To do that, you need a screen capture software or app. You don’t have to spend a dime on a screen capture tool. Most platforms actually provide you a free screen capture tool. Use a free screen capture tool. If the test requires you to video yourself during the test, it will probably require you to talk through the process as well. And for that, you need a microphone. Chances are you probably have one already. If not, the good news is that it doesn’t have to be a fancy one. These are the only things you need to make money as a website tester. That said, each site operates differently, so some may have other requirements such as a webcam to record yourself during the test. But in general, a computer equipped with a microphone and a screen capture program, and of course a fast internet connection should be sufficient enough for most projects. How much money can you make user testing? …the platforms you use, the test itself, test requirements and duration. Generally, though, you can expect an average of about $10 per test. Some beta testing sites pay a little more and some a little less. But I’d say $10 is the average for a 10-20 minute long test. It really isn’t that hard to earn an extra $100 a month as a website tester. You could make much more than that if you joined more than one or two sites (so you can get more tests) and devoted a decent amount of time to it. And if you keep an eye on tests that pay more, you could get lucky, like this guy who made $60 in 69 minutes on UserTesting. So the potential is there, it is just a matter of you seizing the opportunities that become available. 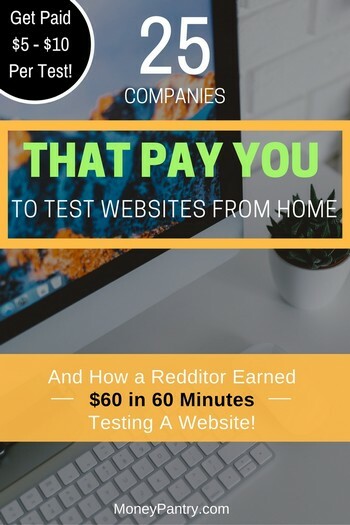 Companies that pay money to test websites! Pay: Varies based on tests. When & how do you get paid: PayPal, after each successful test. This is an awesome company that has been around since 2008. They run short user tests and design surveys. You earn credits for each test. One credit equals to $0.10. Now each test has a different number of questions and surveys you need to respond to. And every survey/question usually takes less than 60 seconds to respond to. Most tests pay 1 credit per response although there are some that pay more. According to the company, you can earn around $6 to $10 per hour taking tests. It’s not the best rate, but you can do these tests in your free time and essentially make money from your couch. Requirements: Desktop, tablet or smartphone, Internet connection. Pay: $5 to $10 per test. When & how do you get paid: PayPal, within 21 business days after the study. This is a must-join usability testing panel that conducts tests for desktop and mobile platforms. To get started, sign up for free, complete your profile and download the free UserZoom’s eCertified testing software. Once that’s done, wait for invitations to available studies. When & how do you get paid: PayPal, weekly. With Userbrain you’ll test websites through their app. To get started, sign up and download their free Chrome or iOS app. The app enables you to speak while going through a specific set of tasks. Each test takes anywhere from 5 to 15 minutes. Pay: $5 to $25 per test. When & how do you get paid: PayPal, within 5 business days. Validately conducts mobile and website tests for companies. They have different forms of studies you can participate in. You have the usual tests where you visit a site/app and then answer a few questions. You also have what are known as “Live” tests where you talk via phone and do a screen capture to share with the study moderator. Live tests usually take about 30 minutes and pay a minimum of $25. Smaller tests take around 5 minutes and pay about $5. Pay: $5 for every accepted feedback. When & how do you get paid: Every Monday via PayPal. Their main focus here, as the name applies, is on startups. They help startups conduct tests to find and fix potential issues so they can have the best version of their website/product. You can sign up for free and start immediately (look for the “Submit Feedback“) button on the homepage. Requirements: Computer, Internet connection, Microphone, Webcam. When & how do you get paid: Every Friday through PayPal. You’ll have to record a video of yourself during the process. Sometimes you will also have to provide written feedback. When & how do you get paid: One week after the test via PayPal or Payoneer. With UserFeel, you’ll visit each website and speak to your microphone as you go through the process. You do have to take a “qualification” test before you are officially accepted as a paid site tester. When & how do you get paid: PayPal, as soon as your test is approved. With Userlytics you’ll have to record yourself while doing the test. Their tests usually take about 10-20 minutes. What I particularly like about Userlytics is that they accept testers from all over the world. Requirements: Computer, Internet connection, Microphone. Pay: $10 for every completed test. When & how do you get paid: PayPal, 7 days after the test is done. UserTesting is one of the most well-known remote user testing companies. To get started, you have to sign up first but before you are approved, you’ll need to take a “sample” test. If they like what they see, you are in! Their tests also last about 10-20 minutes. They also do app testing. So if you are interested in getting paid to test apps, this is one platform you definitely want to join. When & how do you get paid: PayPal, on the 25th of each month. This is a remote testing company based out of the U.K. They work with some of the top companies and businesses around the world including Virgin Atlantic Airlines. To get started you’ll have to sign up, download the screen recorder and take a practice test. After that, you’ll wait for tests to become available. They’ll send you an invitation email whenever there is a new test ready. Requirements: Computer, Internet connection, Screen Recorder. This is a new(ish) site that is quickly becoming popular. You’ll have to record videos of your screen as you review the sites and talk about your experience as you go through the process. When & how do you get paid: PayPal, once a month. You have to be at least 13 years old to participate. There are very few sites with no minimum payout requirements. Enroll makes my favorites list because it has a very low minimum requirement of only $1. That’s right, as long as you have $1 in your account you can request a payment. Requirements: Computer, Internet connection, Webcam, Microphone. Pay: Pay varies based on the project. When & how do you get paid: PayPal or Payoneer, on the 15th and the last day of every month. uTest is a part of Applause network, a company that specializes in offering user testing services for websites and digital products like software. This is a very serious platforms with a lot of potential test projects that you can make money off of. Not only you can make money as a website tester, you can also get paid for trying apps and software, finding bugs, taking usability surveys and more. You can even earn bonuses. Requirements: Skype installed on a laptop or PC, internet connection, microphone. Pay: € 50 (about $58) per test. When & how do you get paid: PayPal or Direct Deposit to your bank account, 10 days after the test. This is one of the few companies that not only does remote website testing but also conducts test studies in person where you (the tester) have to show up at a customer’s office and conduct a guided test in person. For remote testing, you will do the test via Skype. They do what’s known as “guided tests.” Basically, every time you’re invited to a test, a moderator will help you through the process. When & how do you get paid: PayPal, as soon as your test/bug is approved and you are credited. This is more of a bug finding site than a straight website testing. This company focuses on helping developers find bugs and issues with their websites and apps. You then get paid for every bug you find according to the bounty. The cool thing is that the platform lets you see already found bugs so you don’t waste your time. You can also earn bonuses by being the top big finder. Pay: Varies based on each test. When & how do you get paid: PayPal, 7 days after the test. This is another platform that conducts tests for websites, apps, and software. The main requirements here are a computer and internet connection, but there are some tests that may require other things like microphone or screen capture recording. 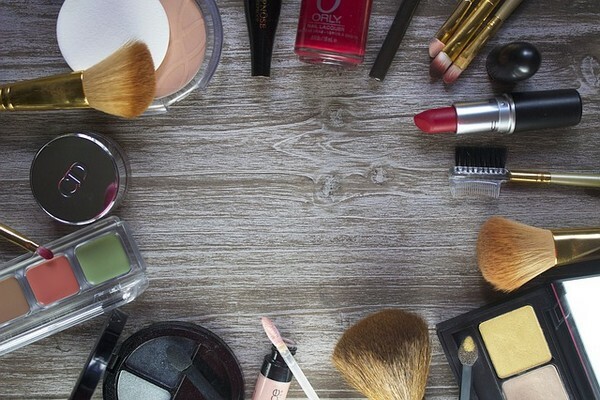 When & how do you get paid: PayPal or virtual goods like Amazon or iTunes gift cards. If you like testing with your smartphone or tablet, this one is right up your alley. They mostly run app tests, but occasionally they do website testing as well. They don’t say exactly how much they pay for tests. And apparently, you earn reward points that you later exchange for cash or “awesome” gifts. Pay: up to $50 per bug and varied amounts for rating apps. When & how do you get paid: PayPal, Payoneer, Skrill, once a month. This is another site that also pays you for finding bugs and issues on sites you are testing. What I like about this one is that you can get paid even if you don’t find any bugs or issues, by rating apps. Pay: About $20 per test. With TestBirds not only you can make money for testing websites, but you can also get paid to for testing new apps and software. The pay varies here based on the test. According to the company, an average test takes about 15 minutes and pays about 20 Euros or 15 pounds (a little over $20 USD). Pay: Varies based on the test. When & how do you get paid: PayPal or Vouchers, once a month. Ferpection is another remote user testing platform that conducts user testing on apps, software, and websites. If you don’t like the idea of recording yourself or speaking through the test process, you’ll like this one since it doesn’t require you to speak or video yourself. All you do is write your feedback and send it in. Requirements: An internet connected device. When & how do you get paid: PayU or PayPal, monthly. 99tests is a crowdsourced testing platform that enables companies and developers to quickly and easily find remote testers from all around the world to find potential bugs and issues on their websites, apps or software. They work with companies like Intuit, Flipkart and Paytm. 99Tests is one of the biggest testing networks with over 20,000 testers. …there are a lot of test projects to get your hands on! The following sites were part of the original post, but are no longer in business. We’re keeping them here just for archival reasons. When & how do you get paid: Through mTurk. You can’t actually sign up as a tester on their website. Instead, they direct you to join Mturk and take part in available user testing assignments through Mturk. When & how do you get paid: PayPal, monthly. This one is a rather small and unknown site, but very much liked by its members. Pay: Up to $5 per study, depending on its length. Most of their studies take around 10 minutes, but they also have some that take as long as 30 minutes or so. The longer the study, the bigger the payout. When & how do you get paid: PayPal, 15 days after the test. This is for testing websites in Spanish. Needless to say, you need to know Spanish to be able to join the site. Pay: Varies based on the task. When & how do you get paid: Your earnings are credited to your Amazon payment account, which you can use to buy stuff on Amazon.com or transfer to your bank account. Mturk (which I wrote about in detail in our Mturk review) is a division of Amazon corporation. It is not an exclusive user testing site. It’s a micro job site where companies and businesses list small tasks. As a worker, you can do these tasks and earn money. Website (and apps and software) testing is actually one of the most often posted tasks on mTurk. So, if you want to earn money testing sites, you definitely want to sign up here. Plus, there are so many other kinds of tasks you can do to make money on mTurk. If you’re looking to earn a little pocket money here and there in your free time, website testing can provide an easy way for you to make money from home. To make it worth your while be sure to join as many as you can. Each platform may only offer a few website testing jobs a month, so you won’t make much on one site. But join a dozen or so and you’ve got yourself a lot of website testing jobs and opportunities every month. UserBob uses Mechanical Turk workers to user test websites and apps. If you are using Mechanical Turk to make some extra money, try out doing a “UserBob” HIT. John, do you guys not accept testers directly on your site (UserBob)? Is all testing done through the Mturk system? Yes…Their logo, “This SUX” is a good moto for TryMyUI given their questionable business practices. UserTesting.com has given me the most oppertunities, but I havn’t qualified for them when I click on them. Be careful because when you have created your account and are selecting a test from your dashboard as your first one, it is a sample that they review to approve you or not. You’ll see that there are TONS of tests to select from for your first. After you’re approved from the first test, the selection of tests is not plentiful as you first saw. You might get a couple a day. So just be aware of what to expect. And they ask qualifying questions when you select a test, so there’s a very good chance you won’t qualify for the test. You need to sign up for MULTIPLE sites. You need to make sure that the site offer the ability to email you when there’s a test. It’s a lot easier to have one window up to check for emails, than it is to have a bunch of windows open for the different panels you can monitor. You need to know that there are THOUSANDS of people signed up on the sites. they are on the order of 10’s of thousands. IF you think there are going to be a slew of tests you can do, think again. I have signed up for 10 sites and have only gotten approved for 5 tests out of maybe 10 or 12, in a week’s time, and I have only been able to take 2. I’ll get an email from a site, click immediately on the link and be told that someone took it within the 10 to 13 seconds of doing that, and getting through their clicks to get to the actual screen recording, and be denied taking the test. There-s a huge demand and very little supply. Good luck. If you know something different, by all means, tell me your ways. Great advice, Chris. Thanks so much for sharing your experience. How long have you been doing user testing as a way to earn extra cash? Can i sign up for all of them? Click on the name of each site in the post and you will be taken to each site where you can sign up. Just want to throw in here that the first link you sited, StartUpLift, sends you to another site that wants you to pay for them to find you work. Tracy, I can’t replicate what you are seeing? When you land on their page, you have to scroll down a little and click the text link that says “Click here to register”. It is under the “How StartUpLift Works” section. FeedBack Army is now closed. It was closed in October 2016. Thanks for the update, Aena. I appreciate you taking the time to let us know. John, Thanks for the feedback. Test.io does state that they pay up to $50 per bug, perhaps the bigger bugs are less common. Have you made money with any other sites on (or not on) our list? Thanks for letting me know! Ashi, Good question. Unfortunately if there are sanctions in your country, you may not be eligible to work for some of these companies. It is my understanding that some of the sanctions with Sudan have recently been lifted, so perhaps PayPal will be an option for you in the future. Good luck! Which sites are more suitable for someone from India? Renish, have you seen this article https://moneypantry.com/get-paid-to-write/ ? Many of these are worldwide companies that you may have some luck with. Keep us posted!